In life we are told some people believe their glass is always half full, and others believe it is always half empty. 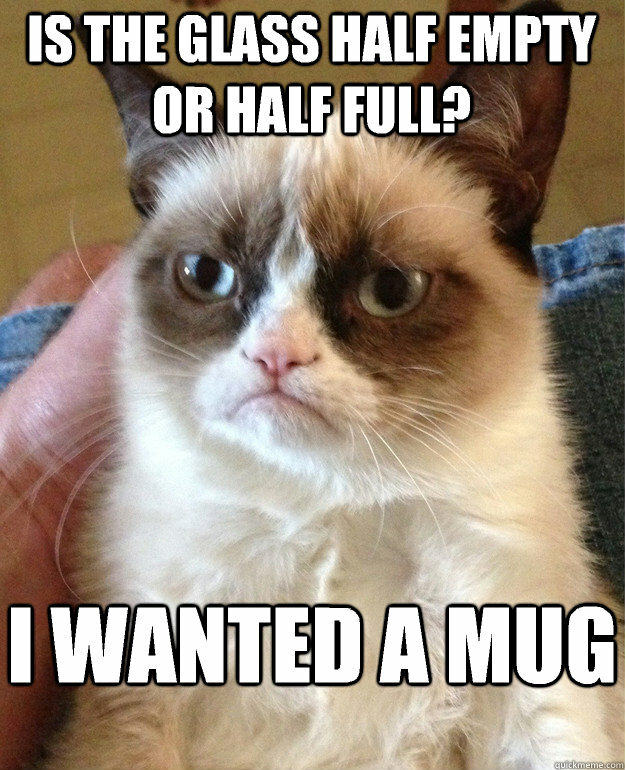 I take the pessimistic view on life believing it’s always half empty. I don’t think like that of a pessimist contrary to my belief. What I mean to say is if we always believe the glass is half full we become enamored by our own design. We begin to believe we are owed everything in the world, and that it can’t or won’t disappear. I understand optimism gets us further in life that pessimism ever will. But in my eyes, if the glass is always half empty we will always have room to fill it up more. It’s kinda of a unique twist on the saying. I’m a writer. I’ve seen a lot of blank pages in my life. I mean every time I go to write a page it’s blank. If I wasn’t an optimist this page wouldn’t be getting filled at the moment. So, how did I take a twist on a pessimistic idea, and create positive vibes from it? When you stare at a page long enough we begin to feel this daunting desire that maybe we won’t succeed, maybe people won’t read our work. There are thousands of ideas out there that deter us from getting the words on the page, and it pains my heart when the staring leads us to writer’s block. We writers are constantly facing a pessimistic idea, and having to create something positive out of it. Our pages will always be blank before we start writing but once our fingers start typing or writing it’s like a magic that we can’t put down. I like to think that we go into that zone like a basketball player on the field, or a gamer when they get so into a game they can’t stop. In this case, I believe a writer is a lot like an athlete. The money might not always be the same, but if you can blog properly then there might be a few thousands of dollars in it for the writer. ( I do need to move my blog to wordpress.org soon. Any donations are welcome…jk jk …I think I can come up with the money after paying my graduation fee~~~right.) We are constantly going into the zone when we write. Sometimes, I get so into the zone that I can’t actually stop myself from what I’m writing. It kind of spills out like some sort of magic. If our glass is always half empty then we will always be able to fill it. I mean it’s easier to fill something if it’s half empty then half full right? I like looking at the opposite idea here. 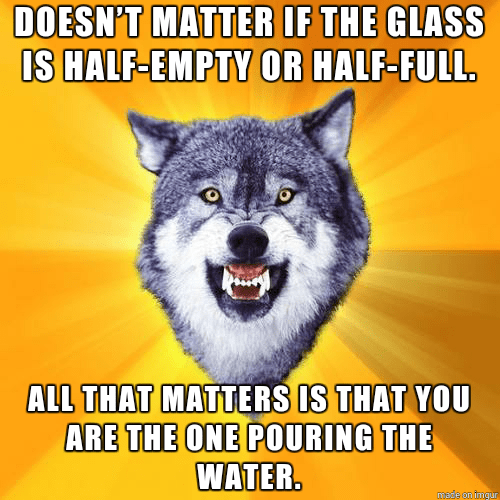 If my glass was half full I don’t think I’d be as capable of wanting to fill it because half of it is already there. I mean I am half lazy sometimes. But if something was half empty I’m more likely to jump up and want to fight for it. An Athlete is more likely to make an effort if they are one point away from losing then if they were fifty points away from losing. The same can be said for us writers. We are more likely to just get our books written if we are already fifty pages in rather than if we are ten pages in. I’m odd writer where most of my stories don’t actually have the start of it written, but have majority of everything else written. In fact, I am itching to keep writing for “ Into The Gray.” I’m also yearning to read more works of writing. If you want me to guest blog on your blog just email me at Jessicacote66@gmail.com. You can also contact that if you have any odd writing work you want me to do. I’m open to job. My guest blogging is free. I just would rather be emailed to know what topic you want me to cover. Again, Thank you for reading. I love you guys. Here is a video from one of my favorite creative youtubers; likes, follows, shares, and comments are always welcome. I love commenting back. It depends on where you start. If you start with a full glass, than the glass is half-empty; if you start with an empty glass, than the glass is half-full. I start a project full of enthusiasm, but it drops off after it reaches a certain part, where there are necessary, but not so exciting aspects to project my glass is half-empty. On the other hand, if I start a project, and I am lukewarm, but then I get excited my glass is half-full. When you write “We begin to believe we are owed everything in the world, and that it can’t or won’t disappear.” I find it does not necessarily follow from seeing the glass as half-full. There are a lots of pessimistic people that think the world owes them one. If a page is empty, then as you write, and you reach the half way point, your glass is going to be half-full. However, if you start with a full page and go about revising it, and it is severe, you wind up with a glass half-empty. I realize that this is not completely accurate, but it fits the fact that’s life is variable. Sometimes the glass is half-full, and sometimes the glass is half-empty. Your fourth paragraph is actually supportive of this variability. 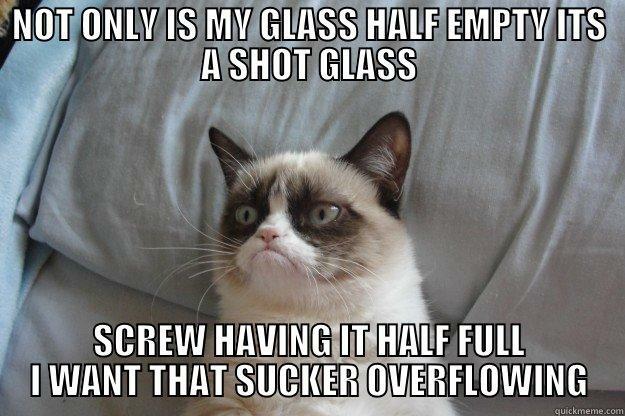 Finally, I would like to point out that mathematically a half-empty glass is equal to a half-full glass, so I ask does it really matter? After all, I rarely think in glass terms. And, how does the volume of the glass affect a situation? Is something harder if the glass is bigger, or less so, if the glass is smaller.s is equal to a half-full glass, so I ask does it really matter? After all, I rarely think in glass terms. 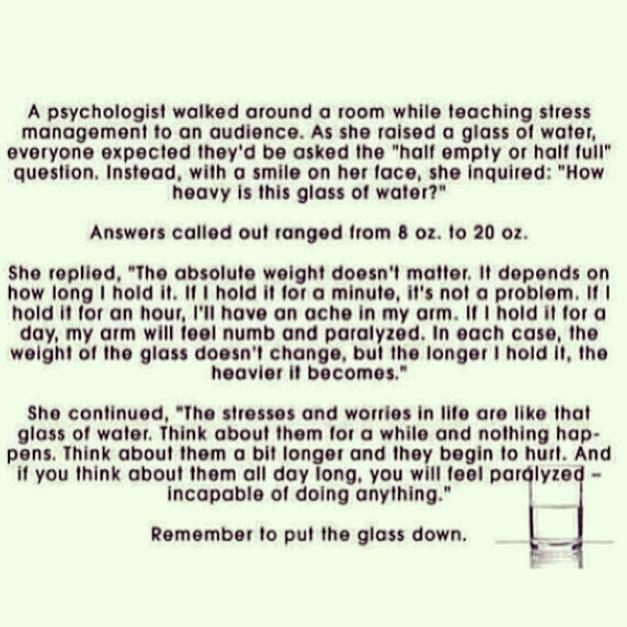 And, how does the volume of the glass affect a situation? Is something harder if the glass is bigger, or less so, if the glass is smaller.